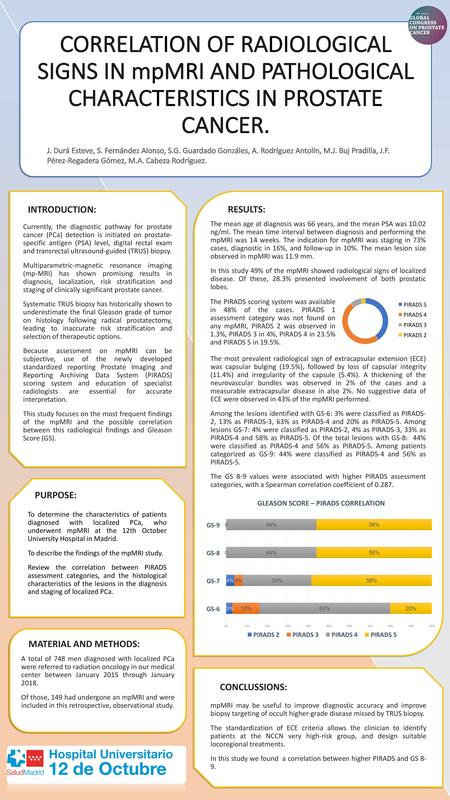 To determine the characteristics of patients diagnosed with localized prostate cancer (PCa) who underwent multiparametric magnetic resonance imaging (mpMRI) at the University Hospital 12 de Octubre in Madrid. To describe the findings of the mpMRI study. To review the correlation between PIRADS assessment categories, and the histological characteristics of the lesions in the diagnosis and staging of localized PCa. A total of 149 patients with localized PCa in our radiation oncology department had undergone an mpMRI between January 2015 and January 2018, and were included in this retrospective, observational study. The mean age at diagnosis was 66 years, and the mean PSA was 10.02 ng/ml. The mean time interval between diagnosis and performing the mpMRI was 14 weeks. The indication for mpMRI was staging in 73% cases, diagnostic in 16%, and follow-up in 10%. The mean lesion size observed in mpMRI was 11.9 mm. In this study 49% of the mpMRI showed radiological signs of localized disease. Of these, 28.3% presented involvement of both prostatic lobes. The PIRADS scoring system was available in 48% of the cases. PIRADS 1 assessment category was not found on any mpMRI, PIRADS 2 was observed in 1.3%, PIRADS 3 in 4%, PIRADS 4 in 23.5% and PIRADS 5 in 19.5%. Suggestive data of extracapsular extension (ECE) were observed in 57% of the mpMRI performed. The most prevalent radiological sign of ECE was capsular bulging (19.5%), followed by loss of capsular integrity (11.4%) and irregularity of the capsule (5.4%). Among the lesions identified with Gleason Score (GS) 6: 3% were classified as PIRADS-2, 13% as PIRADS-3, 63% as PIRADS-4 and 20% as PIRADS-5. Among lesions GS-7: 4% were classified as PIRADS-2, 4% as PIRADS-3, 33% as PIRADS-4 and 58% as PIRADS-5. Of the total lesions with GS-8: 44% were classified as PIRADS-4 and 56% as PIRADS-5. Among patients categorized as GS-9: 44% were classified as PIRADS-4 and 56% as PIRADS-5. The GS 8-9 values were associated with higher PIRADS assessment categories, with a Spearman correlation coefficient of 0.287. MpMRI may be useful to improve diagnostic accuracy and improve biopsy targeting of occult higher-grade disease missed by TRUS biopsy. The standardization of ECE criteria allows the clinician to identify patients at the NCCN very high-risk group, and design suitable locoregional treatments. In this study we found a correlation between higher PIRADS and GS 8-9.
magnetic resonance imaging, Prostate cancer, diagnosis, staging.